The San Antonio Spurs are a mainstay in the NBA postseason having made it for 22 consecutive seasons now. But while they are good enough to make the NBA’s ’second season,’ expectations were not high for them entering the 2019 playoffs. But if there is one thing that can always be said about a team coached by Greg Popovich, it is that you better not sleep on them. 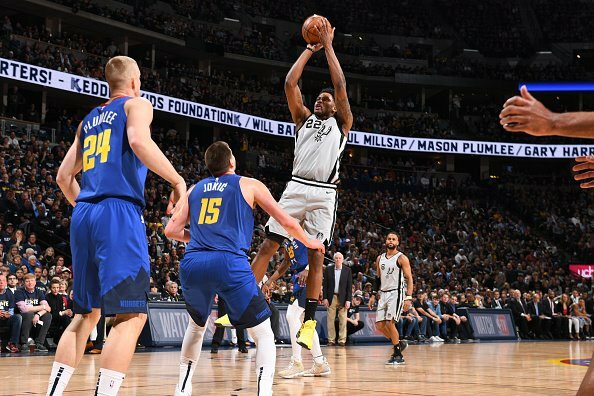 By the end of the night in Game One Saturday, the Nuggets likely wished for sleep in order to get away from the nightmare reality that was the San Antonio defense. Nikola Jokic had led the Nuggets in most statistical categories in the regular season, so the Spurs made a point to take him away as much as they could. While he did make history by becoming the fourth player in NBA history to record a triple-double (10 points, 14 rebounds, and 14 assists) in his playoff debut, the Spurs held him to just ten points. Denver led for most of a competitive first quarter, but San Antonio finished with a 6-1 spurt to take an early lead, 25-20. San Antonio maintained the lead in the second and pushed it out to eight points by the end of the half, 59-51. The Nuggets made a strong push in the third quarter by holding the Spurs to just 13 points. But they only scored 17, so they didn’t make too much of a dent in San Antonio’s lead. In the fourth, the Spurs defense was able to hold the Nuggets off. But with 1:32 left in the game, the Nuggets pulled within one, 97-96, after a 17-footer by Jamal Murray. They would not make another shot. Down by three in the final seconds of the game, the Nuggets still had a shot. But with 2.1 seconds on the clock, Derrick White stole the ball from Jamal Murray, got fouled, and then iced the game with a pair of free throws. The final score was San Antonio 101 and Denver 96. Started off the postseason with a big road W.
DeMar DeRozan led the way for the Spurs on the scoreboard with 18 points followed by White with 16. Bryn Forbes and LaMarcus Aldridge each had 15. Gary Harris led the way for the Nuggets with 20 followed by Jamal Murray with 17 and Will Barton with 15. Denver had the best home record in the NBA this season (34-7), but that clearly didn’t matter here. However, they will have a couple of nights to regroup. Game Two against the Spurs will not be until Tuesday night at the Pepsi Center in Denver. Despite the loss in Game One, Denver is still favored to win Game Two. The spread has opened at -6.5 for the Nuggets (money line: Denver– -275; San Antonio +225). The over/under is just 208.